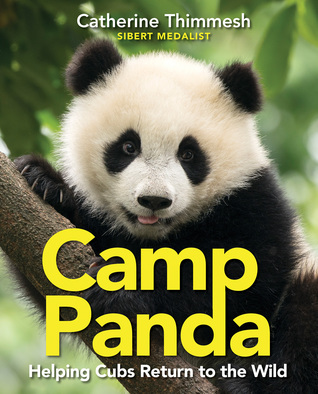 At first glance, Camp Panda appears to be a nonfiction book aimed at very young readers, but the length of the book (60 pages) and the adorable panda face on the cover are deceiving. Upon opening the book readers will find a detailed and lengthy text about efforts to increase the population of pandas in the wild through a reintroduction program. Sibert Medal winner, Catherine Thimmesh, interviewed several conservation experts about the panda population and the reintroduction program. Blending narrative and expository writing styles, the book both informs and inspires readers. Thimmesh provides background information about how pandas became endangered through poaching and habitat loss. Then the focus of the book turns to the panda reintroduction program which prepares panda cubs born in captivity for life in the wild. Over years scientists have made improvements to the program with great success. One change was to eliminate human contact. Instead scientists wear panda costumes when they need to check on the pandas health. There is no cuddling or playing allowed. Full-page, color photographs show pandas in captivity and in the wild. Readers may find the photos of scientists donning panda suits a bit unusual. Purchase Camp Panda for upper elementary and middle school libraries and classrooms. Librarians and teachers will have no problem convincing kids to check it out. Just look at the face on the cover. It would make an excellent nonfiction read aloud (over several days) with many possibilities for follow-up research.